In her 2002 election, Martha was endorsed by leading newspapers and numerous organizations, including, among others, the Professional Firefighters Association, the Police Benevolent Association, the Fraternal Order of the Police, the North Carolina Association of Educators, and the North Carolina Federation of Teachers. Judge Geer has proven herself to be a fair and unbiased judge who follows the law. Her opinions for the Court of Appeals are exceptionally well reasoned and thorough and not the product of any personal or political agenda. She is a superb appellate judge. 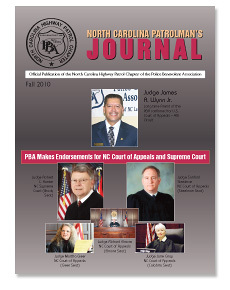 The North Carolina Police Benevolent Association has endorsed Judge Geer on the cover of the fall issue of their quarterly journal (seen here).